Since OpenSSH version 6.7 the default set of ciphers and MACs has been altered to remove unsafe algorithms. In particular, CBC ciphers and arcfour* are disabled by default. This has been adopted in Debian “Jessie”. Modern CPUs have hardware acceleration for AES encryption. I tested five different platforms having CPUs with and without AES hardware acceleration, different OpenSSL versions, and running on different platforms including dedicated servers, OpenVZ and AWS. Since the processing power of each platform is different, I had to choose a criteria to normalize results, in order to be able to compare them. This was a rather confusing decision, and I hope that my conclusion is right. I chose to normalize against the “arcfour*”, “blowfish-cbc”, and “3des-cbc” speeds, because I doubt it that their implementation changed over time. They should run equally fast on each platform because they don’t benefit from the AES acceleration, nor anyone bothered to make them faster, because those ciphers are meant to be marked as obsolete for a long time. # uses "/root/tmp/dd.txt" as a temporary file! 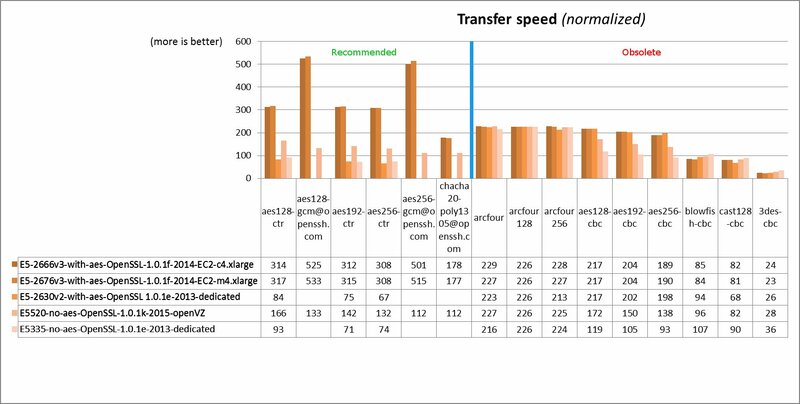 echo "Cipher: $cipher (try $i)"
Servers which run a newer CPU with AES hardware acceleration can enjoy the benefit of (1) a lot faster AES encryption using the recommended OpenSSH ciphers, and (2) some AES ciphers are now even two-times faster than the old speed champion, namely “arcfour”. I could get those great speeds only using OpenSSL 1.0.1f or newer, but this may need more testing. Servers having a CPU without AES hardware acceleration still get two-times faster AES encryption with the newest OpenSSH 6.7 using OpenSSL 1.0.1k, as tested on Debian “Jessie”. Maybe they optimized something in the library. Test results may vary (a lot) depending on your hardware platform, Linux kernel, OpenSSH and OpenSSL versions. Categories: Linux | Tags: AES acceleration, benchmark, cipher, Linux, openssh, ssh | Permalink.